The statistics are staggering. Border Patrol Nation details that prior to 1986, there were rarely more than 2,000 people deported each year. “By the late 1990s, the U.S. government was deporting more than 40,000 people annually, still only a fraction of what we see today. By the early 2010s, Homeland Security was expelling well over 400,000 people per year from the United States.” This drastic increase in deportations has taken place just as a variety of U.S. states, most famously Arizona, but also Alabama, Georgia, Indiana, South Carolina, and Utah have passed laws obliging local and state police to enforce immigration law.Though much of the book is devoted to documenting the work of the border warriors, Miller also meets with a wide range of families and communities affected by racist border policing. He documents their stories with great care, and succeeds in showing the cruel absurdity of a massive police force dedicated to criminalizing and deporting hardworking people who are mothers and fathers, and their children, simply because they do not have residency. As in Canada and elsewhere, Miller notes that people who open the door to their home even just a crack give border police license to force their way in without a warrant. Though he’s based on the U.S.-Mexico border, Miller takes us to various border worlds. The book starts and ends at the Super Bowl, which he likens to a showpiece for public-private policing and for the creation of entertainment from border enforcement. He takes us to his hometown of Niagara Falls, which is across an increasingly policed line from Canada. He brings us to the sovereign lands of the Tohono O’odham nation, where locals estimate that the majority of resident have suffered abuses at the hands of border agents. He also takes us to the Dominican Republic, where U.S. Customs and Border Patrol plays a role in ensuring the border with Haiti is strictly enforced. It is at a checkpoint along the river between the Dominican Republic and Haiti that Miller powerfully explains how massacres are often part of border building. There, Dominican forces under U.S.-supported dictator Rafael Trujillo killed an estimated 20,000 people in 1937. “The expulsion of Haitians and the massacre—which mostly targeted Haitians but also included dark skinned Dominicans—were the acts that imposed the Dominican-Haitian border,” he writes. But lest we believe that such barbaric acts took place only in locations on the edges of empire, Miller reminds us of the history of the borderlines in the continental U.S. “What happened in 1937 could’ve been anywhere. It could have been the tens of thousands dead and wounded during the Mexican-American war, strewn in what is now the U.S. Mexico borderlands with the blood of Manifest Destiny. It could have been the slaughter of 5,000 during the War of 1812, establishing only a small portion of the international boundary between the United States and Canada, and the imposition of U.S. territory on the Iroquois,” writes Miller. Todd Miller’s powerful prose belies what one hopes is a growing sense of outrage at the inhuman and racist goals of U.S. border enforcement. 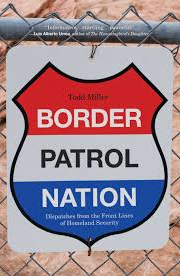 His journeys from place to place and the complexities he presents within the Border Patrol itself provide the reader with a comprehensive picture of what’s wrong in the United States. This is a book that should not be ignored.